WASHINGTON, DC — President Trump’s suggestion that school teachers be armed as part of an effort to enhance school safety for children has been rejected in separate comments by Tennessee Governor Bill Haslam and Metro Nashville Schools chief Shawn Joseph since the terrifying Florida school shooting in late February. Other school leaders are staying on the sidelines of the issue, despite growing demand from high school students for lawmakers to restrict use of military style assault weapons. “I’m not certain I see arming teachers as being the answer, because I think there’s a very small percentage of teachers who say, ‘Yes, I want to do that,’ Governor Haslam said in an interview here with POLITICO, the well respected Capitol Hill newspaper. “I don’t know what the number is, but I bet it’s less than 5 percent who would say ‘I’m willing and able to do that,’” Gov. 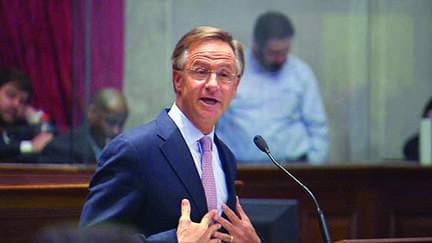 Haslam was quoted as saying. His office later confirmed the interview had occurred while the governor was here at the annual meeting of the National Governors Conference. The issue of gun control was not immediately on the conference’s agenda. However, it became a talking point after the Florida school shooting became a national topic with President Trump who enthusiastically advocated arming teachers would be a good part of the nation’s response to incident attributed to a young man who was a former student at the South Florida high school who as felt to have suffered from a lack of mental health care. Days immediately after the shooting, Florida’s Republican Governor Rick Scott, usually a reliable backer of gun rights, broke ranks and took strong issue with Trump’s idea, asserting there were a variety of steps Florida and other states and communities could take to address the issue of boosting school safety. Possibly arming teachers was not a practical idea, Gov. Scott said. In Nashville, Metro Public Schools Superintendent Dr. Shawn Joseph is said to question the idea of arming teachers to provide student and staff protection. “He believes arming teachers is not a good idea,” said Michelle Muchaud, school system public information officer. “We need less guns than more,” she said, adding Dr. Joseph believes it is the role of “professionals” to have the needed guns on campus to use, if necessary. The Metro Nashville School system, which serves some 100,000 children and adults a day, has an extensive school security operation, noted Michaud with security resource people assigned to each school. School systems in a sampling of other Tennessee Counties found school leaders unwilling to lead ahead of political leaders, saying they had no opinion to offer on the President’s idea and would defer to their school board leaders before directly addressing the issue of arming teachers. In Murfreesboro, home of the Rutherford County Schools System, Superintendent Don Odom, a 50-year veteran of the system, is “following the law until we hear otherwise,” said James Evans, spokesman for Odom. “We’re focused on keeping our students safe,” said Elise Shelton, spokesperson for the Clarksville-Montgomery County Public School System, noting the school board and system had nothing to say at present about the current discussion about steps to boost school safety. She ticked off a string of steps the 35,000 students school system has put in place to achieve their goal. She said improving school safety has been an ongoing priority of the system since the Columbine High School massacre 19 years ago in Colorado. President Trump has not firmed his ideas of what steps he would like to take, despite his comments just after the school shooting in Florida, despite several great opportunities to test the receptivity of his idea. He did not bring it up here this past weekend when the National Governors Association held their annual conference at which he spoke. He has said nothing to Congress since it returned to work earlier this week, despite the filing of several proposals by Republican and Democratic lawmakers to enact laws reeling in the sale or military style assault weapons. The Republican controlled Tennessee legislature is expected in March to consider a variety of proposals addressing the issue of arming teachers. Several proposals wound into Senate bill 256 would allow “properly trained” teachers to be armed, if the local school superintendent wants to allow it, according to a spokesperson for Senator John Hensley. The Tennessee proposal, rooted in legislation that was introduced before the Florida shooting, is expected to come to a vote in the Tennessee legislature as thousands of high school students from across the country are expected to converge on Washington to demand tougher gun laws.